Greetings! I'm Micah James. You may know me as the Fantasy Football MagicMan, and perhaps some of you even participated in the exclusive preseason chat hosted here on Deadspin a few months ago. I live and breathe fantasy football, and am here to help each of you double check your team and qualify for your league's playoffs. Away we go. We are in the thick of the 2013 season. Fans have a pretty good idea of which teams' offenses are good (those Bronco guys jump to mind) and which teams' offenses aren't so good (any Jags or Bucs fans in the house?). To that end, you should have a solid grasp of your fantasy team's strengths and weaknesses. At this point, your job as owner is to leverage those strengths while trying to improve the roster wherever you can. One way to improve your fantasy team is by trading with other owners in your league. Trying to address all of the variables and nuances of working a trade deal is beyond the scope of this short post — but I will say that in almost every fantasy football trade, the team that ends up owning the best player in the mix is the team that gets the better end of the bargain, no matter how many players had to be traded away to get him. Another way to add talent to your squad is through your league's waiver system, and with the bye weeks upon us, this is more important than ever. Working the waiver wire is how fantasy championships are won (and lost). The very best fantasy owners are looking not just to the current week, but looking ahead two, sometimes even three, weeks to gain an advantage over their opponents. Arguably the two most critical weeks of this season (other than the fantasy playoffs, of course!) are weeks 8 and 9, when six teams will be on a bye. If you own superstar players like Matt Forte, Arian Foster or Ray Rice, you'd better be ready for week 8. And week 9 forces owners to be without the Broncos and Lions, among others — no Peyton, no Calvin and no Reggie Bush to name just a few guys who'll be taking that week off! Bryce Brown and Chris Polk (Philadelphia Eagles) — So far neither guy has done much behind LeSean McCoy but both have had opportunities and I believe the Eagles will involve them more moving forward. The Eagles host the Giants in week 8 and travel to Oakland in week 9, two matchups that should provide fantasy value for these backs. Golden Tate and Doug Baldwin (Seattle Seahawks) — The Seahawks certainly don't throw any more than is necessary, and there are whispers that Percy Harvin may be back in uniform by then (although I doubt it) — but if you need to add a wide receiver for these weeks, either of these Seahawks can be serviceable. Seattle travels to St. Louis in week 8 and hosts the Bucs in week 9. Mychal Rivera (Oakland Raiders) — Tight ends are usually easier to come by on the waiver wire, so it may not be necessary to grab Rivera right now. But the Raiders have two favorable draws in weeks 8 and 9 hosting first the Steelers, then the Eagles. If you are in a pinch at this position, Rivera could be a sneaky fill-in, as his role continues to expand in the Raiders' passing game. Later this season, thanks to our friends at State Farm, I'll be hosting three live conversations, along with my colleague Russell Baxter, on three Sunday mornings (11/17, 12/1 and 12/8). We'll help you double check your teams by answering your last-minute lineup questions. I'm super excited for the opportunity, and look forward to helping you on the road to your championship. Until then, best of luck in all your fantasy football matchups! It pays to double check your lineup with Micah James just like it pays to double check for discounts up to 40% on auto insurance with State Farm®. 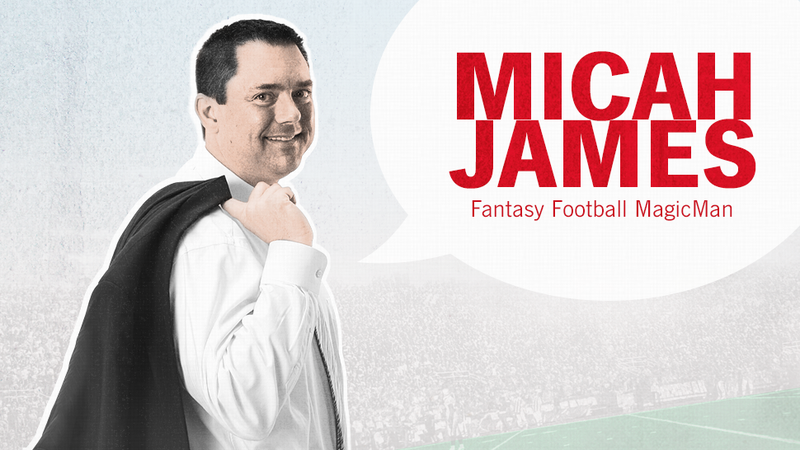 Micah James won the Fantasy Sports Trade Association's Accuracy Rankings Challenge in 2012, beating over 60 other industry analysts and finishing inside the top 9 for all four skill positions (QB #3, RB #1, WR #9, TE #2), something which had never been done in the history of that contest. You may have heard him on Sirius XM’s Fantasy Sports Radio, or you may have listened to his weekly fantasy football podcast, Trick Plays. Find him on Facebook, on Twitter, and of course at the FFMagicMan homepage.